It should be apparent that failing to run a recurring donations program means you’re missing out on an important revenue mainstay. In addition to providing a steady stream of support for your organization, recurring revenue programs also deepen the level of engagement from donors. Recurring donors are committed members of your supporter community who, over time, can really serve as the lifeblood of your mission. Watsi is a nonprofit that partners with top-rated healthcare organizations to provide high-impact, low-cost healthcare for underprivileged people worldwide. Watsi, which is a technology-driven startup, crowdfunds every procedure by connecting donors to individual patients. Donors can browse patient galleries and help fund a particular patient’s procedure. Watsi’s model is powerful because it brings donors face-to-face with impact they’re making in one person’s life. 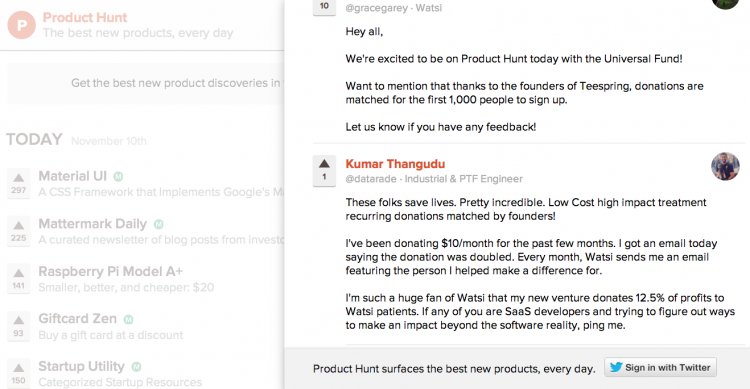 Last week, Watsi launched a new recurring donations program called The Universal Fund. Sign up and your recurring donation will automatically support a new Watsi patient every month. By Friday, Watsi had signed up more than 620 members committed to donate monthly. That added up to $20,000 in recurring monthly gifts for the organization and, thus, its constituents. Wow. 622 people are committing a collective $20,000 a month for Watsi patients. Thank you. $20,000 in 2 Days? How Did They Do It? This is an awesome success story for an organization establishing a new recurring donations program. Watsi has just under 5,000 followers on Twitter and just over 7,500 likes on Facebook which, in comparison to similar cutting-edge organizations like Charity:Water, is pretty small. So just how did they create such great momentum and success right out of the gate? 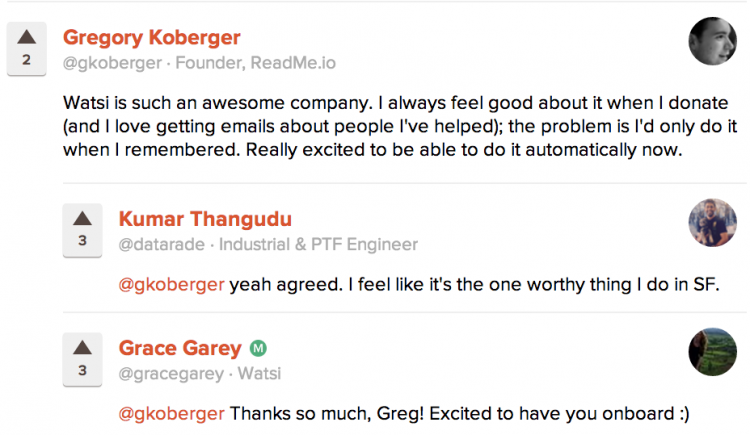 Watsi is a Y Combinator alum. Y Combinator is one of the nation’s leading startup incubators (a program that funds and mentors new technology companies) and it has a large following of tech-savvy, innovation-crazed supporters who generally care about having a positive impact on the world. This no doubt helps Watsi’s credibility with new donors. The Universal Fund also made its way to Product Hunt, another Y Combinator participant, which is essentially a forum where a lot of those tech-savvy, innovation-crazed change makers hang out and talk about new and interesting products offerings. They received some pretty amazing testimonials on their post, which no doubt solidified their reputation with this audience. However, your organization doesn’t have to be high tech or hailed by Silicon Valley to launch a successful recurring donations program; you just has to reach the right audience. (Don’t believe us? Check out Team Rubicon’s stellar, fast growing recurring donations program). Find out where people who really care about your cause hang out and reach out to those places and communities to announce your program. Even better, ask a few staunch supporters to vouch for your organization or personally get in touch with a few members of that community to build trust and recruit cause evangelists. Another audience tip: While you may be tempted to push your campaign through every channel imaginable, sometimes it pays to focus on one channel and leverage it really well. Although Watsi has more followers on Facebook, they mainly used Twitter to communicate about the campaign. It is easier, and more manageable, to call out new members on Twitter. Plus, Twitter is very effective for quickly amplifying campaign updates. In order to maximize social media for a recurring giving campaign, think about how you want to spread the word about your campaign, where your audience congregates and how you plan to use one channel really well, rather than many sort-of-well. Donation matching rocks. Everyone loves to see their dollar stretched further, especially for a cause they believe in. Establishing a committed partner to match donations is an incredible incentive for people to make a monthly recurring donation. Watsi is offering donation matching to the first 1,000 Universal Fund members. To ensure you’re part of the matched crew, you’ll likely sign up immediately rather than wait and risk being the 1,001st member, thus losing your impact steam. There is no doubt that the name of their recurring donations program reflects their commitment to achieving universal healthcare worldwide. Being a member of the Universal Fund means you’re a critical piece to that mission statement. Make sure your recurring donations program doesn’t appear for not. It needs to be very clear what a recurring gift’s impact will have on the organization. Answer the question: why should I be a recurring donor versus just a one-time donor? 1. How the donations will occur – automatically, first of the month, don’t worry you can edit. 3. How you’ll know where the money goes – you’ll receive an impact story about the patient you supported. This transparency builds the necessary trust you need to recruit monthly recurring donors. Remember, monthly donations are a very meaningful commitment, which means the donor needs to trust their donation is both necessary and used rightfully. It’s the small things that matter during any campaign, really. Watsi created a very thoughtful and powerful precomposed tweet (actually, a Twitter Card) for new members to use as soon as they join the Universal Fund. And they have retweeted every single person who has shared their newly minted membership. Believe it or not, studies have shown that despite all the seemingly offhand, impulsive details people share on social, expressing support for an organization or cause publicly is a very meaningful form of engagement. Secondly, by showcasing staff’s excitement as they approached a campaign milestone. It’s a nice personal touch that helped Watsi cross the finish line. Lastly, when they did hit their campaign goal (in monthly recurring revenue), they tweeted out a very humble announcement. The significant impact being made by only 622 people is a huge motivator to join the campaign. If 622 donors can generate $20,000 a month for universal healthcare, imagine what 1,000 Universal Fund members could accomplish? 4. Align campaign attributes to your mission and always, always demonstrate the impact of being a recurring donor. A little thoughtfulness, cohesiveness and creativity can go a very long way, as demonstrated here by Watsi. Remember, you don’t need to have a big budget or be some cutting-edge tech company to be effective, you just need to plan ahead, know your audience well and engage all your supporters with enthusiasm and gratitude!